Free download latest version of AkelPad. Have you ever used Note Pad default application in your Windows? Actually, AkelPad is like Windows Note Pad by look and by functionality. The main different is its advancement. It is an open source application with some of simple but latest features. It has been designed to create text documents as simple Note Pad does. Having simple interface it is an efficient software program. You can find various options and functions just by clicking at Menu Bar given in the main window of the program. The screenshot is given here; you can see all the options. And yes these are so simple in use. 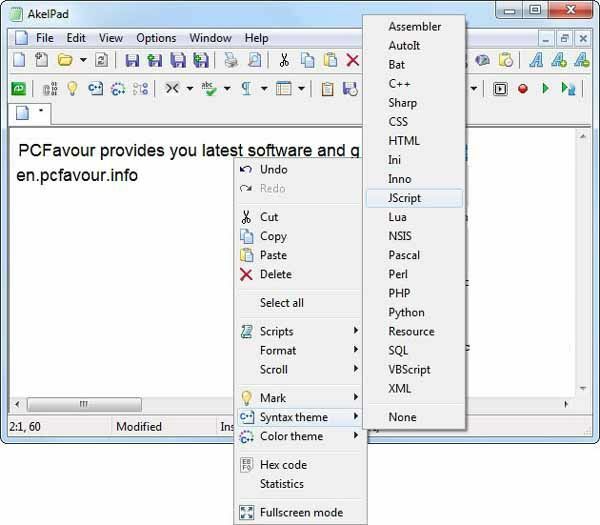 You can have simple cut, copy, undo, redo, select all and paste functions using this program. You can search a specific sentence or word from the whole document. In case of replacement, you can replace a particular word or sentence from the document just by a simple command. Notice that these are the basic and simple functions which are common in such kind of softwares. You can put current date and characters into the software. The application allows you to change the uppercase into lowercase letters and vice versa. Now talking about some of its advanced tools which attract most of the users; AkelPad allows you to color the whole text documents or some specific words or sentences easily. Most of the text writing softwares are unable to see your documents in just reading mode but AkelPad do so as well. While using the program you will have a status bar which can also be removed as per your concern. Its interface allows you to change the languages which make it a vast program which can be used by anyone who even belongs to any other language rather than English. It is all about Unicode format.